Yesterday the Nasdaq Composite and the Nasdaq 100 (QQQ) both breached and closed below their respective 50-day moving average for the first time since December 2016. The 50-day moving average is a widely followed moving average, whether this breach and close will mean anything, only time will tell. 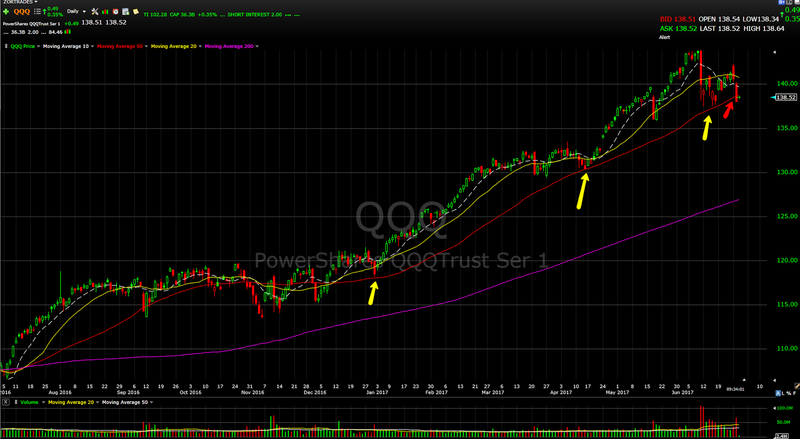 The outcome in the QQQ and Nasdaq composite in the near future will either strengthen or weaken the 50-day narrative. As you can see in the chart below, you can see the smoothness of the price action in the NASDAQ 100 until 6/9/2017. Since then the price action has been loose and volatile. The Semiconductor index has been a leader in the market, and like the Nasdaq, the price action went from smooth to loose and volatile. 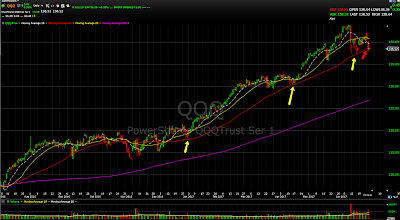 I would recommend some caution in the tech names until the price action tightens up. STOCK OF THE WEEK RECAP.